Well, I'm finally back from a short vacation to the North Shore area in Minnesota. It is beautiful there this time of year with their spectacular Fall foliage. 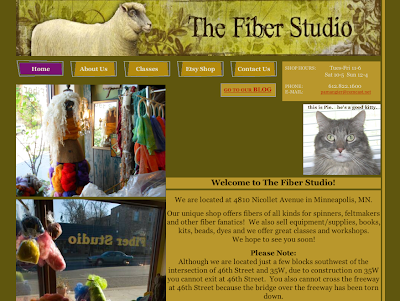 I hope to have some photos to post of my mini vacation next week, but for today, I wanted to share a wonderful new store that I discovered in Minneapolis - The Fiber Studio! I actually came across their website while searching online for fiber supply places to visit while on my vacation. I always try to stop into to two or three local shops whenever I'm traveling. This time, I feel like I really hit the jackpot with The Fiber Studio. It has a wide variety of roving in a rainbow of colors. You will find merino roving, corriedale roving, harrisville fleece, and more. They also carry a lot of other fiber related supplies such as dyes, silks, yarns, and many, many other things big and small. It is a quaint shop in a very neat area of town. If you are traveling to Minneapolis or live anywhere near there, I highly recommend that you stop into The Fiber Studio and browse. Also, the owner is a super sweet and knowledgeable lady to talk with, and her prices are very reasonable. I ended up with two large bags of roving that weighed just under four pounds! I plan to go back there when I'm up that way again in December as a vendor at the No Coast Craft-o-rama. I can't wait to browse and buy some more! Also, The Fiber Studio has an Etsy shop so stop in there and browse. It will be worth your time! hello, I'm from Brazil and I also have a blog of handicrafts, congratulations your creations are beautiful! Want to swap links? Visit my blog too.